This is the only Hunter card in Kobolds and Catacombs with the Recruit mechanic. Join the discussion on our forums! Come discuss Kathrena Winterwisp over in our dedicated Kathrena Winterwisp discussion topic. Battlecry and Deathrattle: Recruit a Chargey Boi or Savannah Highmane. This card is crazy with Ultrasaur and few beasts in your deck. For the longest time I was deliberating whether or not to dust this card. I'm very glad I ultimately didn't, because bears and dinosaurs are awesome. Got a golden today.. Guess the summoned minions will be golden too? No. I guess not. Will keep this for a while at least. This just dropped... is it useless? My version is in my signature if you wanna try. I haven't been having much success with it but it actually seems promising and may work with some minor tweeks. I don't think this deck will perform well. It has a couple competing synergies that cancel out each other's effectiveness. 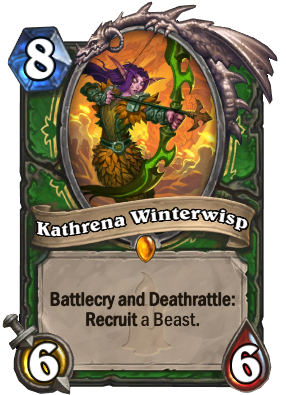 Kathrena has no good beasts to recruit aside from Violet Wurm (and even that is not as good as a beast with "Charge" imo, like King Krush or Charged Devilsaur), and if Y'Shaarj recruits your Wurms instead, is she going to be recruiting Tundra Rhino? Seems like a waste to me. Likewise, if Y'Shaarj recruits Kathrena, you wasted her battlecry. Barnes also wastes her battlecry but at least you keep the original in the deck and you got an easy trigger for her deathrattle next turn. Anyone gave this a test yet? The more I think about it I think this is the most OP card released so far, maybe in the game...Its crazy if you build your deck right a secret hunter list with this in it running BIG Beasts to support it is INSANE GOOD! It's only random if you don't know how to build your deck properly. Hunter has a ton of beast-generating spells, more than any other class. You have Animal Companion, Cat Trick, Wandering Monster, Venomstrike Trap, Snake Trap, Flanking Strike, Lesser Emerald Spellstone, Unleash the Hounds, Piranha Launcher, To My Side, Rexxar's hero ability (the card is in your hand, so it can't be recruited), Ball of Spiders, and Call of the Wild. And this is just in Standard, not even talking about Wild. If you want to build your deck properly with Kathrena, you use spells for small minions and beasts she can recruit for big minions. a good card for midrange hunter.